Take the top two rushing games in the storied history of Nebraska football. No shame if those days are hard to recall right now, they were: 677 yards in a 68-0 win over New Mexico state in 1983, and 641 yards at Baylor in 2001. That’s two games where very good teams beat up on not very good teams, but there is a point here. You add those two games together you get 1,318 yards rushing. The 2017 Cornhuskers, over 12 games, rushed for a total of 1,290. And that’s just one of the problems from the season that ended on Friday with a 56-14 loss to Iowa. You also have to talk about the interceptions (17 on the season, 16 from Tanner Lee), and, oh my gosh, the defense. One could write a book on this year’s Blackshirts, and have a second volume composed solely of Bob Diaco transcriptions. But this is Nebraska, the school that led the nation in rushing 15 times, the most of any school, since 1963. Seven of those nation’s best seasons also rank among the 20 best rushing seasons ever in college football. Running the ball is always going to be the reference point here until someone comes along and does it better a different way. Those days are not now. They could be coming soon, but you never know. Even dream candidates have the potential to become nightmares. This all would be a lot easier if that wasn’t the case. But for now you can let those 1,290 rushing yards in 2017 stand as a bleak reminder of just how far back the Huskers have to climb from this 2017 season and, really, the cumulative effect of the past 16 seasons. This is not a style of play or offensive scheme discussion. Numbers like that are just poles at the opposite end of the spectrum representing what Husker fans have seen Nebraska football be and what it is right now. The gap has never been wider. I feel like I've written that numerous times over the years, but it hasn't stopped growing. And it’s going to take a special coach, Mike Riley or otherwise, to step up to the challenge. After the loss to Iowa, Riley, who dropped to 19-19 over three seasons, said he hadn’t been informed of his future at Nebraska. But everyone else seems to believe they know. It’s too hard to see any alternative. Look at the gap. It’s far from all Riley’s fault, but the last guy at the table always has to pay the tab. So Husker Nation will wait for official word. It feels like the waiting has been going on for weeks behind the scenes. Back before Nebraska gave up 166 points over its final three games, a reader asked what the blueprint is for a successful Husker program in this era of football. 1. Be process-oriented. In my observations, almost every successful coach at any level in any sport is. Nebraska has an edge when it comes to this one. There is a pride-in-the-work ethos that permeates the state. It’s there and Nebraska football needs to tap into it. “If all you're concerned about is winning the game, you missed the best part of the game, and that's playing,” Wisconsin Coach Paul Chryst said in a story released this week. That’s easier to say than it is to instill, but it’s essential in my mind. The proof will be in the play. It was the recruiting mention that stopped me. Talent matters in college football, but it’s too often used as a cure all. Nebraska is presently very far away from needing to worry about its talent level, and the challenges of recruiting to Lincoln are such that it’s probably never going to have “enough” talent. There will always be a team with more. So how does a team win when that’s the case? The right talent in the right system is more valuable than pure talent enough of the time to make it viable. Iowa is quite good at this. It requires in-depth knowledge of what works and a detailed plan. Nick Saban has the most talent, yes, but it’s also precisely the talent he wants. He rarely gets credit for the latter. 3. Be adaptable and ego-less. The days of the coach as demigod are over. They’re still treated as such if they win, but I think those that win often do so because they don’t view themselves that way. It’s a tough line to walk. A coach without a plan isn’t going very far, but he has to also know that yesterday’s plan, even if it delivered the best results, perhaps isn’t the plan of tomorrow. A lot of times that absence of ego only comes with experience. You might not be able to find it (or afford it) when considering the options, but the potential to get there is important. Put it in the blueprint as an ideal more than a trait if you have to, but it definitely goes in my blueprint. Would checking those three boxes fix Nebraska football? I don’t know. I’m just an observer, not an athletic director and definitely not a coach. 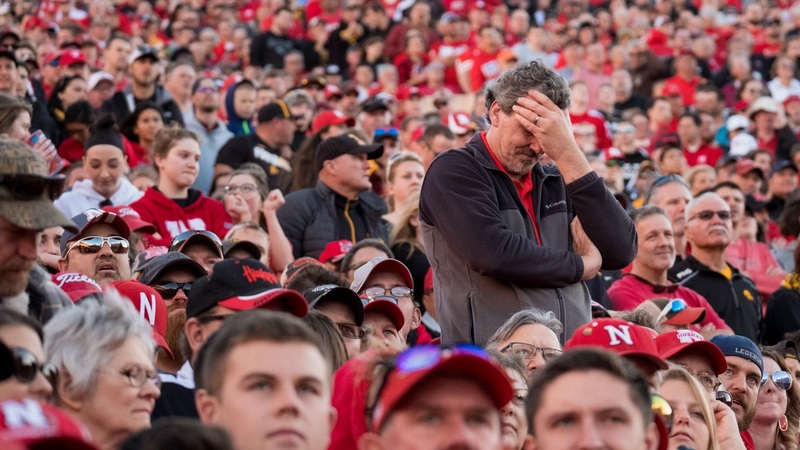 It’s not a proven plan, but when I think back on the days when Nebraska was able to rush for 600 yards on a Saturday, I think I see glimpses of those three things. Bill Moos surely has his own blueprint. It’s still rolled up. Nobody’s seen it yet. Nobody know what the boxes are, how many Riley does or doesn’t check or who might check more of them. But I’m sure we’ll find out soon enough.